Sylvia Weinstein, a founder of Socialist Action and a former writer and business manager for this newspaper, died on Aug. 14 in San Francisco. She was 75. We will not forget Sylvia Weinstein. Who could? Sylvia-with her outspoken opinions, her biting wit, and her deep love for humanity-made an indelible impression on almost anybody who met her. Many more people, who never met Sylvia in person, will remember her through her writings. Her column, “Fightback,” ran every month for 16 years in Socialist Action newspaper. Sylvia helped to establish Socialist Action as a new revolutionary organization after she and other Trotskyists were expelled from the Socialist Workers Party (SWP) in 1983. But her work in the revolutionary socialist movement had begun years before. In 1945, at age 19, Sylvia and her husband Nat joined the (then Trotskyist) SWP in New York. Her talents as a “Jennie Higgins,” an all-around hands-on party activist, soon came to the fore. In the mid-1950s, Sylvia began work in the national office of the SWP. She also found time to be active in the burgeoning civil rights movement and in defense of the Cuban Revolution. When Fidel Castro visited New York City in 1960, Sylvia was an organizer in the Fair Play for Cuba Committee. The committee arranged Castro’s stay in the Hotel Theresa in Harlem, where he met with Malcolm X and other Black leaders. Sylvia used to tell about how reporters and photographers for the daily papers, which were trying to dig up all the muck and lies they could to defame Castro, snapped pictures of her as she was leaving the hotel. The next day, the headlines and photos in the newspapers portrayed Sylvia as a “$100 call girl” who had just paid a call on Fidel! In the mid-1960s, Sylvia and Nat moved to San Francisco to strengthen the SWP branch in that city. Sylvia became deeply involved in the movement to end the war in Vietnam. And when the womens’ liberation movement began to gather strength, Sylvia played a leadership role in it. Sylvia was a key organizer and speaker in the fight to gain childcare centers for working parents in San Francisco. She also helped lead the struggle to obtain (and later, to defend) pro-choice abortion rights. Whenever necessary, Sylvia was out on the street with other pro-choice activists, defending the abortion clinics against right-wing thugs. In her often spellbinding speeches, she counseled activists to rely on the strength of mass action in the streets, rather than on the promises of Democratic Party politicians. And the Democrats feared her as an opponent. San Francisco Mayor Willie Brown (then the speaker of the California assembly) even tried to shove her off the stage during her speech at an annual Day in the Park for Womens’ Rights-which she had helped to organize. In 1985 and 1986, Sylvia ran as the Socialist Action candidate for San Francisco Board of Supervisors. In her 1988 campaign for Board of Education, she received over 21,000 votes. 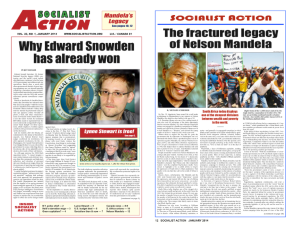 In 1985, Sylvia began her monthly “Fightback” column in Socialist Action. Sylvia saw her writings as a way of teaching people-especially the young generation-why and how to struggle. Her method of teaching was often a deeply personal one. She included stories about her own experiences, ranging from her childhood in Kentucky during the Depression to her early activities in the socialist movement. Sylvia often spoke and wrote about her interests in animals, plant life, and people of every description. This reflected her deep love for all of life and her unbounded optimism that working people will take control of society and, under socialism, change the entire world for the better. We in Socialist Action are saddened by the fact that, shortly before her death, Sylvia chose to leave our party. Just six months ago, when discussion was beginning to get underway for the Socialist Action national convention, Sylvia and Nat Weinstein and 25 other comrades left our organization and set up another group, the Socialist Workers Organization. Their unwarranted departure from Socialist Action was a blow to the goal we had shared of constructing a revolutionary socialist party in this country based on the working class and its allies among the oppressed and the youth. Nevertheless, Sylvia’s life will be cherished as an inspiration for future generations. She was a working-class fighter and revolutionary socialist to the end.